'I have also seen plastic on every beach from Land's End to Dover. In the same stretch of water French trawlers have been attacking English trawlers claiming the English boats are damaging the ocean floor forever in their bid to over-fish scallop's. Across the pond what was once considered paradise is now a Red tide algae bloom from Tampa Bay area to the Florida Keys and is killing thousands of sea-creatures with a mass mortality never seen before in the US. On the Pacific coast common murres, little seabirds have been washing up dead by the hundreds of thousands along the shores of Alaska all the way down to San Francisco for the last four years, the reason is thought to be a lack of fish along the west coast. In 2017 marine mystery confounded residents of southwest Nova Scotia who watched thousands of dead fish, starfish, crabs, clams, scallops and lobster wash suddenly up on the shore. Earlier this month, a sea surface sample was the warmest it has been since records began in 1916. Researchers measured a sea surface temperature of 78.6 °F, which was 0.2 °F greater than the previous record from an unusual warming event in July 1931. These temperatures are on par with what is observed off the coast of Miami, Florida during winter months, which are known to be the warmest waters around the continental United States. Given that ocean waters in San Diego are often warmest in August, this record could again be broken later this month. Cod populations have nose-dived joining the list of seabirds, seals, whales, salmon, sardines, starfish, dolphins and tuna along the north-west coast of the US. According to Hal Bernton of The Seattle Times, the Gulf of Alaska cod populations appear to have nose-dived, a collapse fishery scientists believe is linked to warm water temperatures known as “the blob” that peaked in 2015. The 2017 trawl net survey found the lowest numbers of cod on record, more than 70 per cent lower than the survey found two years earlier. The cod decline likely resulted from the blob, a huge influx of warm Pacific Ocean water that stretched — during its 2015 peak — from the Gulf of Alaska to California’s offshore waters. Residents of Plympton, a small community in Digby County, had been finding dead herring on the shore of St. Mary's Bay for more than a month, but suddenly all other marine life started washing up dead no reason for the deaths was ever found. Another indication to the decline of our oceans is the massive increase in jellyfish due to lack of fish who feed on them. Increasing reports from around the world recently of swarms of jellyfish washing up on beaches is just another pointer to the incredible stress our oceans are suffering. At its peak, 300 tons of radioactive water was leaking daily into the Pacific from the stricken Fukushima plant with no known technology to fix it. In 2017 a study by the University of Hawaiʻi at Mānoa has revealed almost 50% of fish consumed on the islands of Hawai’i were contaminated with caesium 134 the radioactive finger-print of Fukushima. Our very own Bill Laughing Bear has been measuring and finding a huge spike of radiation in salmon and halibut along the coast and waterways of Alaska, research which has seen him taking a lot of heat and hostilities, especially from people who are commercial fishermen or into fishing tourism. Japan's largest coral reef is 90% bleached becoming the latest victim as coral reefs are dying at a record rate around the world. Warm seas around Australia's Great Barrier Reef have killed two-thirds of a 700-km (435 miles) stretch of coral in 2017, the worst die-off ever recorded on the World Heritage site. 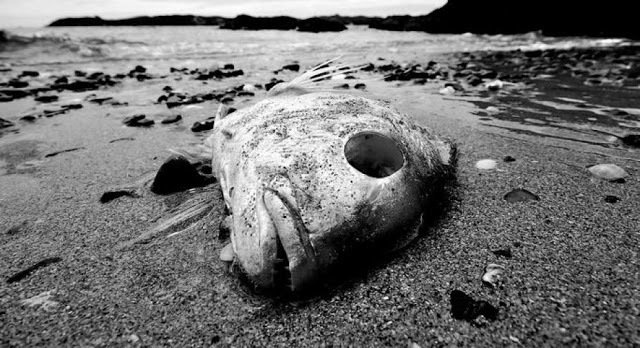 Just how bad is the state of our oceans only Jehovah knows, have we crossed the tipping point? Is there any chance of recovery? I doubt it, man is too greedy to allow our oceans to recover.